Preheat oven to 325 degrees. Mix butter and sugar in large mixing bowl for 3 minutes at high speed. Add eggs and flour. Mix for 3 minutes at high speed. Spread batter evenly between two loaf pans. Place both laof pans in the middle rack of the oven a few inches apart. Bake for one hour or until a kitchen knife inserted into the cakes comes out clean. Cool 5 minutes before removing from pans. Once the pound cake was made and all the cakes were cooled, we took them out of their pans and began cutting this design out. You can see how one circle cake was kept whole, the 2nd was cut out as shown above. On the pound cake, the corners were cut off of it and then we cut a rectangle out of the circle cake that it was sitting in to help support it and to make it not so tall. Three cupcakes were stacked on top of each other. The bottom 2 had the top cut off of them so that they would stack flat. There was a skewer poked down inside of them so that they did not fall over. She iced the circles green and then generously iced the barn and silo in preparation to stick red, peel apart Twizzlers on as the siding. Once the siding was placed, we stuck square cereal on for the roof. We made white windows on the barn and silo, but didn’t use a tip like we should have, therefore, they look a bit messier than they would have if we had cared to make it “perfect”. We used pretzel sticks for the X on the windows of the barn and silo. She made fence out of pretzel sticks, dipped in melted chocolate to glue them together. Iced with Yellow frosting. Topped with Yellow tinted coconut to look like feathers. Cut a yellow gummy fruit slice in half length wise to use as the chicks wings. 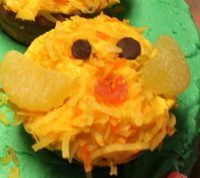 Use 2 chocolate chips for the eyes and an orange fruit slice, cut into a triangle as the beak. Ice the cupcakes pink. Use gummy fruit slices and cut the ends off each one for the ears. We used red because we didn’t have pink. 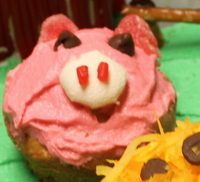 Use a marshmallow for the nose, chocolate chips for the eyes and 2 small pieces of the red Twizzlers for the nostrils. For more birthday cake pictures, you may want to check out the Pink Poodle Cake or the Butterfly Cake. Now that I told you all about how we made the cake, here’s some fun pictures of the actual birthday party. It was a small party, with only our immediate family and his 2 sets of grandparents. Our kids are enough to make a party feel big. We kept having little heads get in the way of our picture taking. He gets a first look at his cake. He’s never eaten cake before….what could this be? First bite. Not too shabby! I think he likes it! So who needs hands to eat cake? Not him!! It’s too good to use hands! Presents are so much fun! He really got into them. A lot of my presents pictures were a bit blurry because my camera setting was set wrong. He had a great time opening presents and eating cake and ice cream. 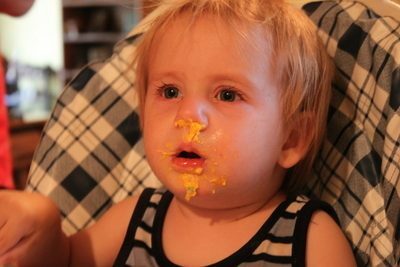 I hope you enjoyed our version of a first birthday party. I still can’t believe he’s already a year old! Cute cake! Very nice job by your 12yo dd and her mama assistant. I did a barnyard cake for my grandson last summer, it’s one of my all-time favorites. Happy Birthday to your special little fella! Looks like he had a great time. Yes, he DID have a great time. Thanks for the birthday wishes! Thank you Kasey! Yes, I love having a 12 year old who is excited about these things. Makes my busy hands go a bit further! Happy birthday to your little guys as well! Yes, a whole day apart! I bet you had a fun birthday celebration!